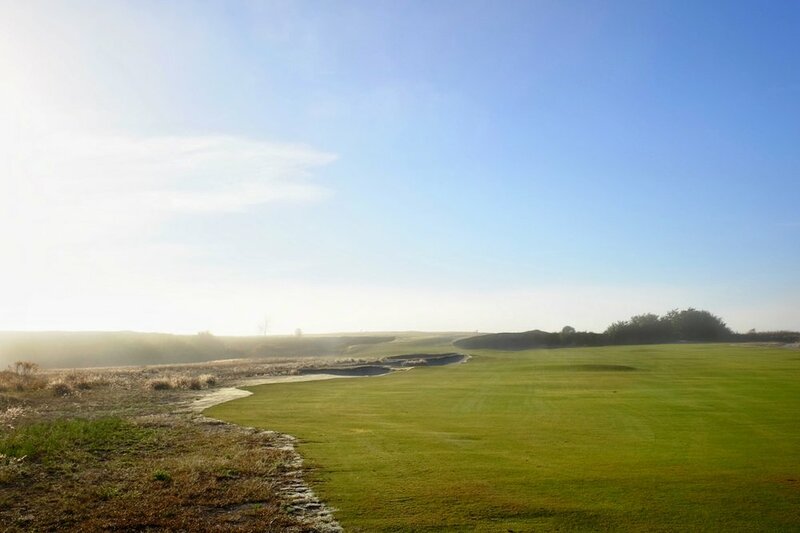 Streamsong Blue was designed by one of today’s most prolific architects, Tom Doak. A man who’s catalog of work boasts highly acclaimed courses such as Pacific Dunes, Old Macdonald and Ballyneal. Over the years, I have been fortunate to play seven Tom Doak golf courses. These experiences have allowed me to begin to gain a deeper understanding of the venerable architect’s design philosophies and tendencies. I’ve found that his designs are generally centered around the principles of playability and strategy. Doak consistently delivers projects that exemplify these principles, often using the recipe of width and bold green complexes. Width allows Doak to create the feeling of playability with the average players, but for the great players, he often throws a centerline bunker or has a specific side of the fairway which is the preferred angle of approach to his wild greens. Doak’s greens are often large and heavily contoured with multiple shelves. These greens wreck havoc on the great players who have to hit pinpoint shots in order to score. Meanwhile, the average player isn’t as dramatically affected because they are often chipping or putting from a distance. This recipe is one that Doak employs to perfection at Streamsong Blue. However, where Doak exudes his true skill is on the flatter pieces of the property, where he was able to generate interesting holes with unique green complexes, risk reward shots and old school trusted template designs. 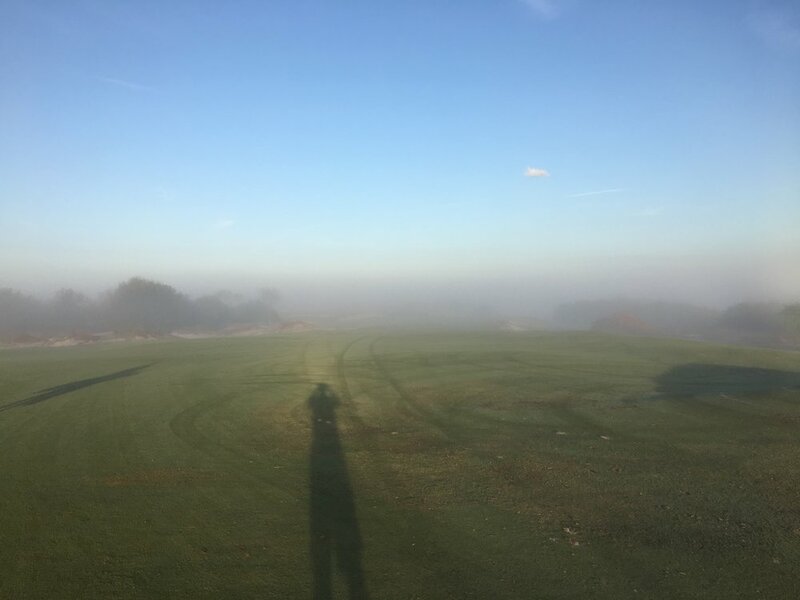 I played the Blue course with Christian Hafer, a great photographer @hafe_life, and we were treated to a foggy early morning tee time which made seeing more than 50 yards in front of us tough for the first few holes. Over the first hour this fog slowly lifted and made for some epic photos. Tom Doak didn’t waste any time showing off the dramatic land at Streamsong as the first tee sits on a 50’ sand dune. Players hit their tee shot down to a wide fairway which is framed by large fairway bunkers on both the right and left side. Depending on the pin location, the right or the left side of the fairway will be preferred and a good drive will leave a little wedge shot into the green which plays slightly uphill. The green is guarded by a lone bunker on the left side and a large sand dune on the right is surrounded by runoff areas that penalize a shot that misses long, right or left. The 2nd tee offers up vistas of what lies ahead. 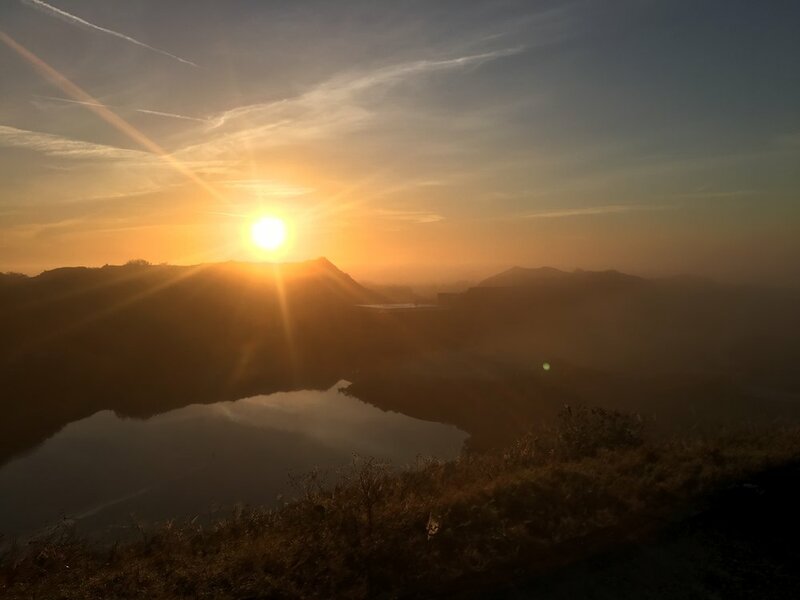 In our case, we were treated to some epic fog that made it seem as if we were on top of a mountain. The par-5 2nd is another great birdie opportunity as the hole plays downhill and has an extremely wide fairway. The 2nd hole is a great example of Doak blending playability and strategy. The key to the second hole is hitting the correct side of the fairway to set up an angle to the green for your second shot. Doak splits the green into two distinct segments with a large and deep greenside bunker. If the pin is left, you want to be on the left side of the fairway. If the pin is right, you want to be on the right side. The 3rd hole is a beautiful par 4 that starts in a low part of the property and runs back up a gentle hill. The tee shot has a lake which cuts diagonally in front and down the left side of the hole with an abundant amount of fairway to the right side. The ideal line is up the left as it shortens the hole and provides a great angle of approach, the only risk is avoiding the hazard. The green sits on a plateau with a steep runoff area in front and on the right side of the green, while the left side is guarded by a bunker and the hazard. The green has a couple of different ledges that make distance control vital on the uphill approach shot. Doak continues to move back up the ridge with the uphill and dramatic par-4 4th hole. Playing at 442 yards and up a pretty significant hill, the 4th gives you everything you can handle. The tee shot is friendly and wide with the favored line up the left side to setup the beautiful approach shot. 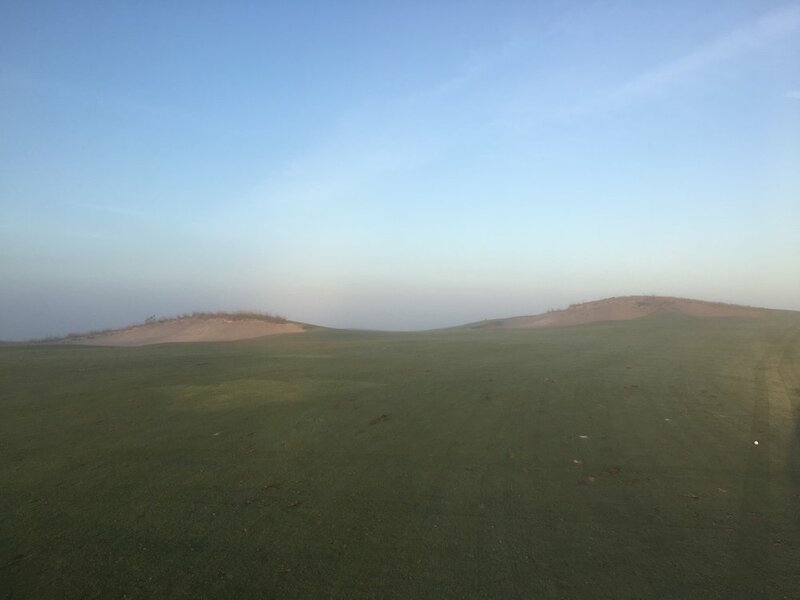 Much like the Red course, Doak shows off the property and the massive scale of the sandy dunes on the 4th’s approach shot by guarding the front right and left sides of the green with large deep bunkers. The green is no picnic either as it slopes significantly from back to front. The 4th brings you back to the top of the ridge that you started your round on for the beautiful short par-3 5th. The hole can play a variety of yardages because of its 74-yard green! The green has a ton of slopes and segments to it with the back half funneling to a bowl on the right side and the front half funneling to the middle of the narrow target. The 5th demands a quality golf shot with both distance and spin control. The stretch of 3-5 ratchets up the difficulty a bit and Doak gives a great chance to get one back at the short par-4 6th. The defining characteristic of the 6th is the massive sand dune which sits behind the green. This hole has shades of a Macdonald/Raynor template strategy. Off the tee, the key is to avoid the plethora of fairway bunkers. I played an iron off the tee, and it left a wedge into the green which sits in a bit of a valley with runoff areas all around it. One of the more photogenic holes at Streamsong Blue is the 7th which runs alongside the beautiful 16th from Streamsong Red. The hole plays true to its yardage and the green slopes hard from the right to left. There is a lot of slope you can’t see because of the shrubs, but a shot right of the green will funnel down towards the hole. The 8th is a quintessential Doak hole. Width and strategy fill the long par-4 8th where Doak uses centerline bunkers to force a decision of left or right. A drive up the left side shortens the hole while the right side will leave a great angle for approach into the elevated and multi-tiered green. The approach is obstructed by a couple of greenside bunkers, a runoff in the front and a small pond. If the approach shot isn’t great, it will leave a very difficult two putt on this diabolical green complex. The front 9 comes to a close with the brute par-5 9th. From the back tees, the massive fairway bunker dictates strategy as the more bitten off the shorter the approach. Something that isn’t evident from the tee is the unbelievable amount of fairway to the left that makes it nearly impossible not to find the short grass if you avoid the bunker. For most, the 9th is a 3 shot hole and the layup is relatively benign with only a couple of bunkers to navigate. The approach to the uphill shallow and wide green complex is guarded by deep bunkers in front and one long one. The green slopes hard from back to front making spin control very important. Much like the Red course, the Blue course features some phenomenal halfway house food. Despite it being about 9:15am, I dove into a couple of tacos. I highly recommend them! The back 9 kicks off with a tricky mid-length par 3, which is guarded by a number of bunkers and a tricky green complex. The green sits diagonally between the bunkers, and the front right section that we played sloped away from the tee making it difficult to hold the green. The longest par 4 on the property has an incredibly wide fairway which is split by a small pot bunker sitting in the middle of the fairway. The bunker is about 260 yards to carry and forces players to decide right or left. Right is safer, while the left is tougher because of the fairway bunkers that run along the left side. However, this side gives the best angle and a clear look at the green. The approach to the green will call for a mid to long-iron and is the only hole without greenside bunkers. Instead, Doak uses a series of rolls to defend the green which can lead to some awkward shots and big bounces. The green is long and narrow with many twists and turns and its strategic tee shot and unique quirks made it one of my favorites on the course. After the flattish 10th and 11th, the 12th brings back dramatic land with a par 4 that was seemingly carved out of sand dunes. The tee shot screams high draw, threading it between the right and left fairway bunkers. A big drive will lead to a wedge approach into the most undulated and bold green complex on the property. 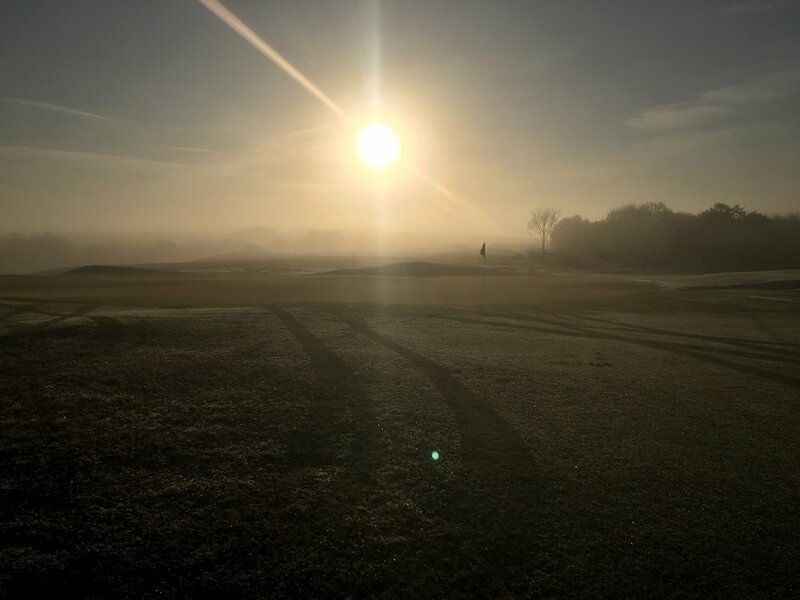 It’s a picturesque shot as the bunker edges are strongly defined and rugged and the key is having precise control of your spin and distance control. One of my few qualms with Doak’s design of the Blue course come here. I found the back portions of the green just too severe considering an absolutely perfect shot has to be hit to have a makeable birdie putt. A great shot that is one yard short or long will find itself in the back bunker or 70 feet away. The 13th stands as one of the great short par 4’s where birdies can be had but a poor decision can lead to a big number. I pulled driver and pulled it, 6 shots later and I’d had enough. The hole runs slightly uphill, and the green is guarded by a few very deep bunkers on the left side. I got in one and it was an extremely uncomfortable and awkward shot. The prudent play is an iron up the right side which will give you a look at the narrow and flat green. Following the short par-4 13th, Doak gives the last great birdie chance of the day. The 15th tees off over a lake and has a great look at it with the right bunker that sits in the ridge you tee over. A good drive will leave a great opportunity to hit the small green in two but those that have to lay up will be forced to navigate a small pot bunker on the right and a massive bunker on the left. My favorite aspect of the 15th is Doak’s small green and runoff areas that reward a great shot and make for a difficult up and down if missed. Doak saves his best for the close at Streamsong Blue, using a few template holes in the final four. The 15th is a modern rendition of the Alps template. Here, the sand dune and bunkering in the middle of the fairway obscures the view of the second shot into the relatively long par 4. A good drive yields a semi-blind approach to the multi-tiered green which features a semi-punchbowl front section flanked by deep bunkers and two other tiers. The 16th is a long par 3 that has all the characteristics of a reverse redan hole except for the back left part of the green running uphill to its own plateau. The bunkers on the right side are treacherous and not a great place to miss. Using the strong left to right slope to run the ball up is the ideal way to attack this challenging par 3. One of my favorite par 5 designs is the Great Hazard, a concept originally used by A.W. Tillinghast during the golden age. Doak’s modern rendition on the 17th is magnificent. The hole design places a lot of pressure on a player hitting a good tee shot, which I didn’t. When the fairway is missed it leaves a very difficult shot to carry the great hazard bunkering, forcing many to lay up short and leave a long uphill approach for your third. If you find yourself in one of the massive great hazard bunkers, the approach is blind to the 17th green which is no easy task. The green’s front half is a false front, repelling anything that is slightly short. The closer at Streamsong Blue is spectacular, utilizing the great terrain to make it memorable. Favoring the right side of the fairway will shorten the hole but bring the bunkers into play. The tee shot runs uphill, and as you reach the top of the hill it reveals a majestic closing shot with the Streamsong clubhouse in the distance. I loved what Doak did here with the green that slopes hard from left to right, making it very tough to hold the green from the left side of the fairway. I really enjoyed my round at Streamsong Blue. Doak’s uncanny ability to confound the great player while being extremely playable for the average player is quite evident. Of the seven Doak designs that I have had the opportunity to play, Streamsong Blue stands as my favorite. It possesses great variety and is an absolute blast to play. The question that constantly buzzes around Streamsong’s property is what course do you like better? The answer typically comes back as a 50/50 split. 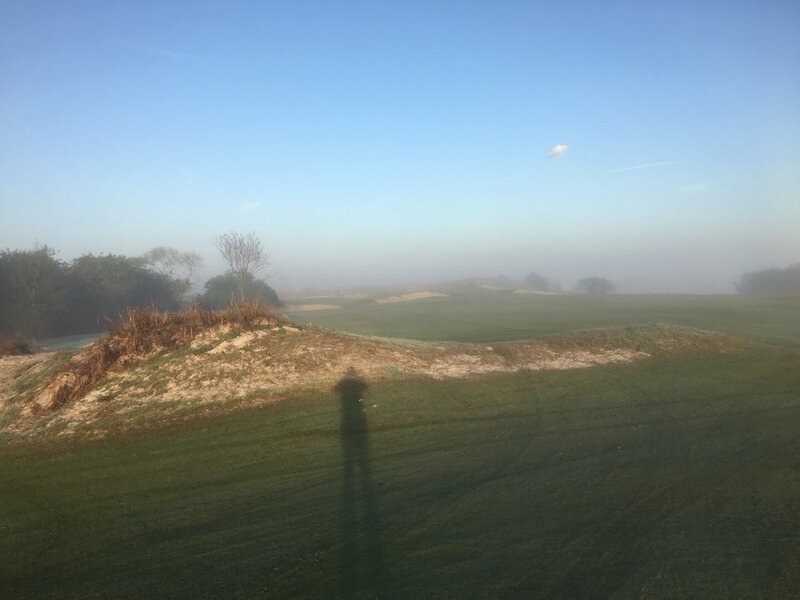 In my mind, Streamsong Blue was a fantastic golf course and one I would gladly play over and over, but I didn’t think it was at the same level as Streamsong Red, which I feel is world class. Love golf courses and architecture? Never miss a post by signing up for our newsletter!